InTouch Machine Edition is an integrated development environment, which allows you to design, develop, troubleshoot, and maintain HMI applications and deploy them into different platforms (operating systems). 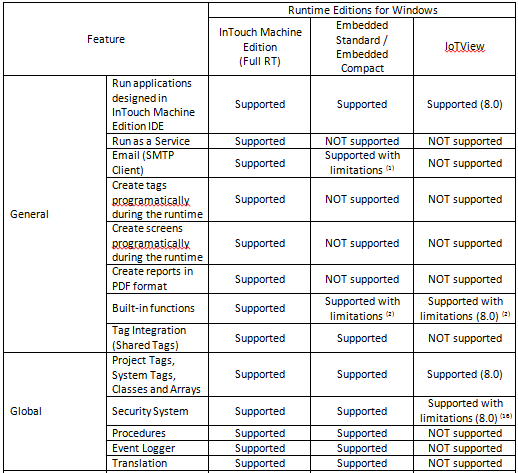 Even though the development environment (and the application) is the same for any platform, Wonderware offers different runtime editions suitable for technical and commercial constraints on each platform: InTouch Machine Edition Full Runtime, Embedded Standard runtime, Embedded Compact, and IoTView runtime. 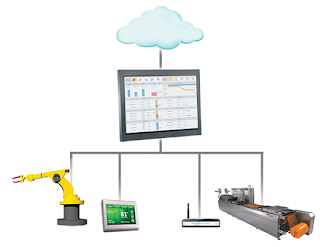 To enable OEMs, Machine Builders, and End Users to create autonomous machines that would seamlessly integrate machine and panel data directly into the Supervisory HMI and historical archive systems for a broader understanding of the entire operation with greater control, faster response times, more extensive reporting capabilities, higher operating efficiencies, and lower total cost of ownership. (1) Encryption supported by InTouch Machine Edition and Embedded Standard, but not supported by Embedded Compact. (2) The vast majority of the built-in functions are supported by all Runtime Editions. 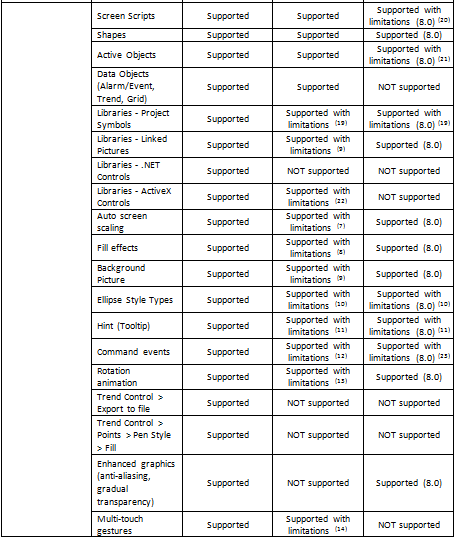 However, specific functions are not supported on specific platforms. The complete reference is available in the Technical Reference manual at "Appendix: Built-in Scripting Language > List of available functions". 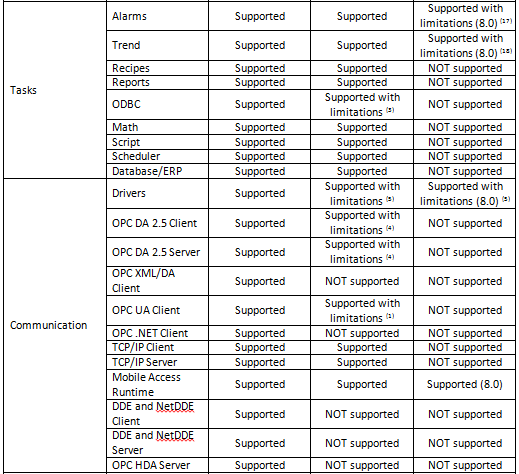 (3) Even though the ODBC worksheets (legacy) are not supported, the Database/ERP worksheets are supported. (4) Multi-thread not supported (single thread supported). Moreover, the image of the operating system must support Remote DCOM. (5) The vast majority of the native communication drivers are supported by many Runtime Editions. 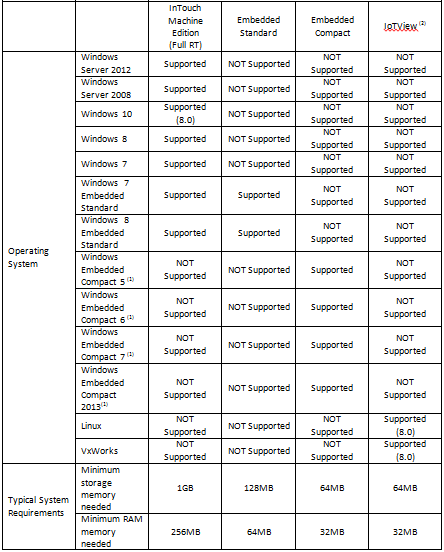 However, specific native drivers are not supported on specific platforms. The complete reference is available through the actual product (Project Explorer > Comm > Drivers > Add/Remove Drivers) and at the Wonderware blog (blog.wonderware.com) Moreover, IoTView supports Main Driver Sheets only. (6) Studio Mobile Access Tabular supported for both Embedded Standard and Embedded Compact. Studio Mobile Access (HTML5) supported by Embedded Standard, but not by Embedded Compact. (7) The screens can be converted to a different resolution by using the command "Home > Convert Resolution". (8) Fill effects are supported for Rectangle objects. (9) The following formats are supported: BMP, JPG, and PNG, as long as the image of the device supports these formats as well. (10) The style type Ellipse is supported, but the style types Arc, Chord, and Ring are not supported. (11) The Hint field will update the Hint System Tag. The graphical tooltip will not be automatically displayed on Embedded Compact runtime nor on SMA Thin Clients. (12) The Command Events "On Down", "While Down", and "On Up" are supported. The remaining Command Events are not supported. (13) The rotation animation is supported for Closed Polygons, but not for Pictures. (14) Embedded Compact does not support "Zoom and Pan gestures on project screens" and "Gestures with Rotation animation". (15) The Hardware from the WiBu manufacturer is supported by all Runtime Editions. The Hardkey from Sentinel is not supported by Embedded Standard/Embedded Compact. (16) Local Mode only. Distributed and LDAP modes not supported. (17) Alarm Online only. Alarm History not supported. (18) History Format Database only. History Format Proprietary and Historian not supported. (19) Project Symbols are supported, as long as their shapes, active objects, and/or animations are supported by the target platform. (21) Pushbutton, ListBox, and Smart Message not supported. Minor limitations in other objects (e.g. : Push-like not supported for Radio Button and Check Box). (22) The ActiveX control must be compiled to the target platform. (23) Built-in language, Open/Close Screen, and Set/Reset/Toggle Tag supported. VBScript not supported.